Located on the University of Toronto downtown campus in downtown Toronto, New College Residence is open throughout the summer months from May to the end of August. We provide affordable and safe dormitory residence accommodation on a great campus! All of our rooms are private, air-conditioned single or double rooms. Double rooms contain two single beds in them. Linen, a towel, pillow, an in-room phone (free local calls) and free wired internet access in each room are also included (to plug in, you must have your own ethernet chord or you can purchase one at the front desk for $5). Communal washrooms and a common room with limited kitchen facilities, cable TV and lounge area are just steps away from each room. Guests will have the option to purchase a full hot breakfast located in the Dining Hall in the Residence (approx. $6) each day throughout the week. A great way to start the day! The University's Athletic Centre which has an Olympic swimming pool, weights room, squash courts and an indoor track is right next door and can be accessed for a small fee. 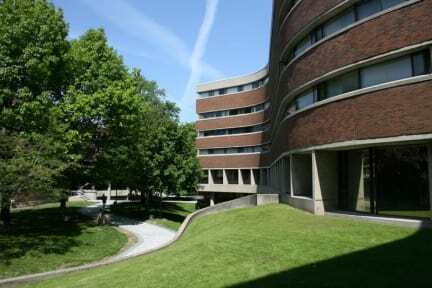 Experience living on the University of Toronto campus where fun and educational walking tours can be arranged. The University of Toronto is a world-renowned university in a celebrated city where knowledge meets achievement, history meets future and ambition meets inspiration. New College Residence is within walking distance to the major downtown tourist attractions, museums, theatres, art galleries, main shopping areas and the entertainment district. New College also has easy access to the metro -streetcar and subway system (it is right outside our door) to take you anywhere you wanted to go in the Toronto area. Estuvo excelente, lo mejor. Sin duda regresaría. It was an excellent option for us, near to the Metro Toronto Convention Center where I has to attend, very comfortable and private. The main desk students were very pragmatic but not very warm, something related to the culture, we suppose. The only objection was that me and my husband have to reserve and rent different rooms during all days we stay although the last night we were allowed to moved to a room together, but we discovered dirty behind one of the beds. Not actually a hostel but (surprise!) University Dorms. Clean, safe and very confortable. You might encounter big groups. I decided to skip their breakfast as there was a whole big school group ahead of me. El lugar es limpio, de facil acceso, cerca del metro, locomoción a la puerta. Lo que mejoraría es que si bien, tiene cocina no tiene implementos para cocinar tu propia comida, por lo que te ves en la obligación de comprar todo afuera. Mis recomendación para este lugar es que cambien las camas , son muy muy incomodas, las sabanas picaban y eso que no habían mosquitos =/ ... Los baños no estaban muy limpios pero estaba bien ... En fin, eso si tienen mucha seguridad. The bed was very uncomfortable, very old and very used ... I think the cleanliness and comfort is very important and this place should improve in these aspects . The secutiry was very good.